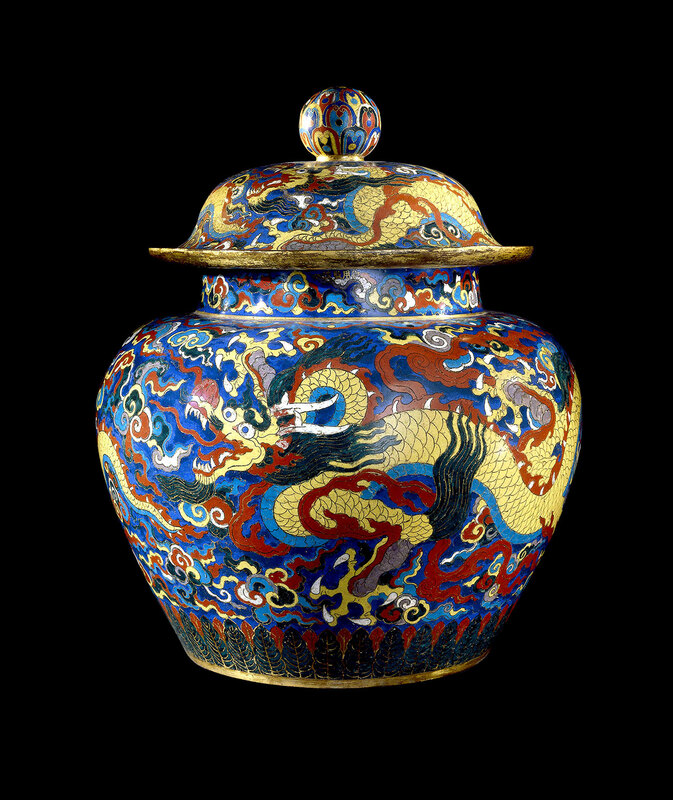 Six hundred years after it first emerged from a Beijing workshop, the exquisite cloisonné enamel jar looks like it was made yesterday. Bursting with vivid colour, its fine gold lines shimmering in the light, and the beady-eyed dragon almost jumping out of the glass cabinet at you. A truly awesome object, that made such an impression on me, I bought a rather splendid mug based on it in the exhibition gift shop. Just one of the many priceless treasures on display in the British Museum’s latest blockbuster, Ming: 50 Years That Changed China. Ming porcelain is the stuff of legend, fetching astronomical sums at auctions all around the world to this day, and still regarded as having set something of an artistic benchmark. Getting this close to it for the first time, I started to understand why. But for all its peerless beauty, in this exhibition the porcelain faces some stiff competition in the appreciation stakes from a wide variety of wondrous objects, all produced during a golden age of Chinese art and culture: the first half of the fifteenth century, or, the early Ming period. From gold and silver cutlery to red lacquer furniture, from intricately painted silk scrolls to elegant calligraphy, and from elaborately decorated swords to magnificent sculptures, the standard set by the Emperors of the Ming dynasty, who commissioned these pieces, was astonishingly high. But perhaps the single most impressive thing about so many of the items in the exhibition, considering the painstaking skill and considerable amount of time required to make them, is the scale on which they were produced. Far from being one-off masterpieces, many were churned out in vast numbers in huge state-funded workshops in Beijing and other major cities (the exhibition does not think twice about referring to these workshops as factories, an odd word to hear when talking about the fifteenth century!). 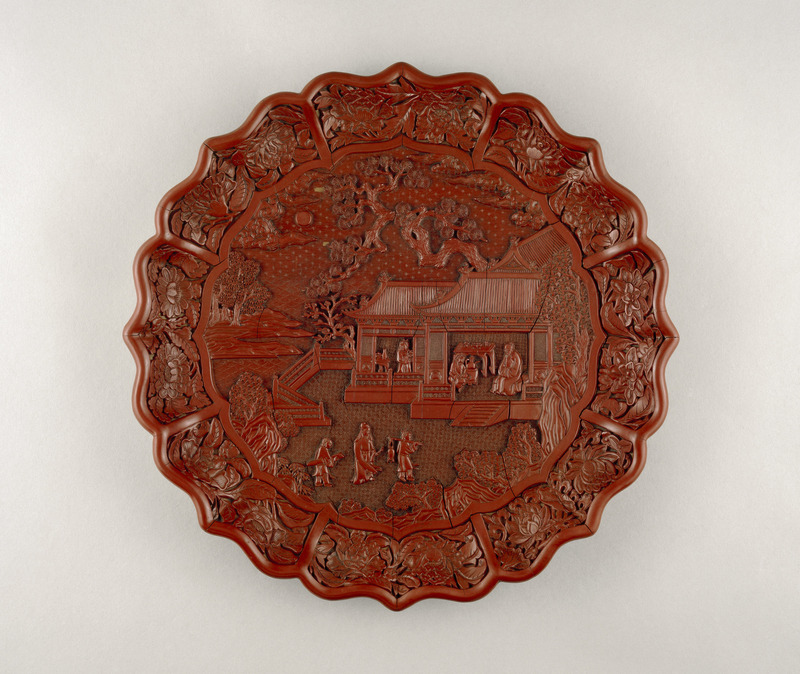 The extremely generous patronage of artists and craftsmen by successive emperors, and the bankrolling of the porcelain, lacquer and metalwork factories, was possible because the Ming dynasty ruled the wealthiest empire on Earth. But for each of the Ming emperors we meet in this exhibition, it was not just about filling one’s palace with nice-looking ornaments for its own sake. Both the quality and the quantity of the beautiful objects that were produced in China at this time bares testimony to this. The Ming dynasty (the name’s literal meaning is “brightness”) was founded in 1368 when the general Zhu Yuanzhang declared himself Hongwu Emperor. He was the first native Chinese ruler since Genghis Khan had conquered China in the previous century. It was largely thanks to Hongwu’s capable rule that by 1400 the Chinese empire was not only the largest and most populous state in the world, but the wealthiest and most advanced society in the world as well (not bad for a man born to destitute peasants and orphaned as a teenager). It was the Yongle Emperor, son of Hongwu, who built surely the most stupendous royal residence in history, the Forbidden City, begun when he moved the capital from Nanjing to Beijing in 1406. The sheer size of the place meant a large amount of fine art and ornaments would have been required to fill it, and probably justified the porcelain workshops alone. But the key to understanding why this period saw these treasures being manufactured on the kind of scale that they were lies in the numerous provinces that made up the Ming empire, each with its own provincial capital city, containing its own royal court. By placing each of their sons in charge of a province, the emperors ensured that the presence of imperial power was felt in every corner of their six-and-a-half million square kilometre-realm. With each emperor having several wives and numerous concubines, there was usually enough sons to go round each of the provinces (the Hongwu emperor had no less than thirty-six of them). It was these princes, and their court of advisors, administrators and bureaucrats, that enabled the Ming emperors to actually govern such a vast territory. It was vital that each prince looked like an emperor, acted like an emperor, and had a court that looked and felt like the Beijing court. So emperors were constantly sending their sons gifts of porcelain, scrolls, furniture and literature for them to display in their palaces, often identical to items the emperor himself already owned. Artists and calligraphers, having been rigorously trained in the styles and techniques of previous generations, were dispatched to all parts of the empire to both produce fine works themselves and to pass on their knowledge to local artists. And thus the art and craft of the Ming era, both in terms of how beautiful it was and how much of it was made, had a crucial part to play in allowing this enormous empire to function. The Ming princes imitated the emperors in death as well as in life. The reason that so many of the objects in the exhibition are in such incredibly good condition is thanks largely to the fact that many of them have spent centuries buried. The three sites from which these artefacts came from, each of them only discovered in the second half of the twentieth century, were each the final resting place of a Ming prince. The deceased would be placed in a vast and highly ornate tomb, along with a wide variety of domestic objects like tableware and clothing to take with him into the afterlife. The gold chopsticks, marked with their weight, date and place of manufacture, look ready to eat with, and while the imperial yellow may have faded somewhat, the crown-prince’s delicate silk robes look ready to wear. The vast majority of the empire’s eighty-five million subjects are, of course, not represented here, the exhibition very much a tale of life at the Ming court. 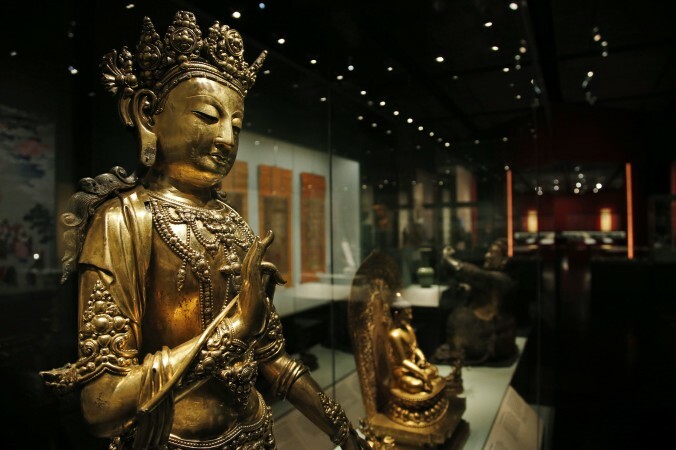 But the section of the exhibition devoted to objects of a religious nature illustrates what a tolerant and multicultural society it was, with at least three major religions – Buddhism, Daoism and Islam – peacefully co-existing both amongst the general population and at the heart of the imperial court. It is worth noting too that part of the reason for China’s large population rise in both the fourteenth and fifteenth century was thanks to a significant increase in food production, itself a direct result of government’s careful management of how land was distributed and how much tax peasants paid (with a little help from the forced mass-migration of farmers from overpopulated areas to baron, unproductive lands). The Ming emperors didn’t just splash their cash on art, either. They invested a huge amount in infrastructure, constructing the largest dockyards in the world at Nanjing (which in turn would produce the largest wooden ships ever built) and renovated the grand canal, linking the Yellow River and Yangtze River. The state also funded an army of over one million men. Some of the battles during the Ming period involved as many as one-hundred thousand troops, making major European battles of the period like Agincourt and Crecy look like playground scuffles by comparison. Let’s cut straight to the chase here. This is a must-see exhibition. I cannot remember an exhibition where the sheer beauty and quality of craftsmanship in every single object was as consistently breathtaking as this. My only gripe is with the title. You may think that this is a minor thing, which would not in any way spoil one’s enjoyment of the exhibition, but you would be wrong. If you want to chose a particular period from which to select your objects, because it’s when most of the best stuff was produced, then fine. After all, three hundred years-worth of artefacts, drawn from the entire Ming era, might have been overkill. But call it something like “Ming: The Golden Age”!. To call it “50 years that changed China” is to suggest that the China of 1450 was distinctly different to the China of 1400, and the exhibition simply did not do enough to convince me that was the case. And I say this as someone who, like most Westerners, had little knowledge of Chinese history before I went in. I believe someone who knows much more about the history of China, and of what became before, during and after the period this exhibition focuses on, will find the title somewhat baffling. Granted, it was a fifty years that saw a great flowering of the arts, as the empire’s finest artists were granted generous patronage by a succession of discerning emperors. But the styles that were employed, and the taste of the emperors, were all harking back to the past. The Xuande Emperor was himself a fine painter and calligrapher, as some of his works on display here clearly show, but so too were numerous emperors both before and after the Ming era. A depiction of the Xuande Emperor out hunting, meanwhile, shows him wearing traditional Mongol dress, much like the hunting outfits that would have been worn by the Ming’s predecessors, the Yuan dynasty (descendants of Genghis Khan). And the great calligraphers of the age spent most of their time reproducing ancient texts, such as the work of the legendary philosopher Confucius (whose teachings formed the basis for the schooling of everyone at the imperial court including the emperor himself). Even the early Ming empire’s political stability, a crucial factor in the blossoming of its art and culture, was only briefly interrupted by the capture of the Zhengtong Emperor after a disastrous defeat by the Mongols in 1448, the abrupt end-point of this exhibition’s narrative. After just four years in captivity the Zhengtong Emperor returned for a second reign, and the Ming dynasty endured until 1644. The fact that by this time the European powers had overtaken China in wealth, power and sophistication only serves to underline the fact that the fifteenth century was not a point in which China made some great leap forward. But rather, when the rest of the world started to catch up. In this regard, the exhibition only “fails” in terms of its ill-judged choice of title. It succeeds triumphantly in a number of other ways. It gives people outside China the opportunity to marvel at a number of wonderful objects that had previously never left the country. It serves as a great introduction to Chinese art and culture for people such as myself who will not be familiar with it. And it provides great insight into just how mystified and curious European traders throughout the Middle Ages must have been about China when they caught tantalising glimpses of objects like these on their travels, and why the search for a direct maritime route to the Ming empire became so desperate (it is said that Columbus, upon his arrival in his accidentally discovered continent, kept asking baffled natives for an audience with the Chinese emperor). The exhibition even succeeds in turning the much-maligned Sainsbury Wing of the British Museum into a warm and vibrant space, in sharp contrast to when it played host to the Vikings earlier this year. Most enlightening of all – and why the title mishap represents, I think, something of a missed opportunity – the exhibition shows how China’s respect for tradition, its reverence for its cultural past, and its handing down of artistic styles from era to era is simultaneously a result of, and a driving force behind, its endurance as a nation-state for four millennia. It is the continuity, not the “change”, that is the hallmark of Chinese history. And the fact that the golden age of the Ming dynasty is still so close to the hearts of all Chinese people today is testimony to that. Ming: 50 Years That Changed China runs at the British Museum until 5 January 2015. Tickets cost 16.50 and can be booked here (£1 fee for online bookings). Tags: 15th century, artist, Avalokiteśvara, Beijing, British Museum, Buddhism, calligraphy, China, Chinese Empire, Christopher Columbus, empire, exhibition reviews london, exhibitions london, Forbidden City, Genghis Khan, Hongwu Emperor, Imperial China, Islam, Ming, Ming 50 years that changed China review, Ming british museum review, Ming China, Ming dynasty, Ming exhibition British Museum, Ming exhibition review, Mongols, porcelain, prince, Sainsbury Wing, Vasco de Gama, Xuande Emperor, Yongle Emperor, Yuan Dynasty, Zhengtong Emperor. Bookmark the permalink. A very good blog for exhibitions, very complete!